The theory of traces is used to describe the behavior of actor systems. The semantics is built from two simple concepts: a set of events representing the reception of messages by objects, and a binary symmetric and irreflexive relation on events—independence—representing permissible concurrency. Causality, the dual notion of concurrency, is expressed by the dependence relation—the complement of independence. A particular execution of a system is described by a trace: a labeled acyclic graph where nodes are labeled with events and the only edges are between nodes labeled with dependent events. The behavior of a system is viewed as the set of traces representing all possible executions. Finally, a composition operation on systems and a synchronization operation on behaviors are presented: they allow to derive the behavior of complex systems from the behavior of its components. 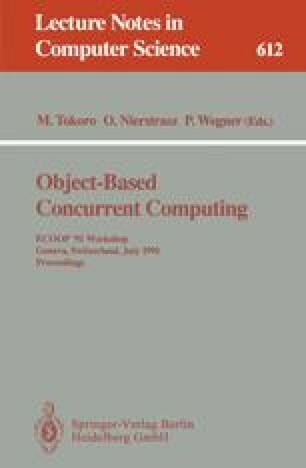 Finally, the authors would like to thank Kohei Honda for its continuous support throughout all stages of development of this project; Prof. Peter Wegner for its constructive comments during his stay at Keio University; and Prof. Akinori Yonezawa for fruitful discussions.